Home | Elevator Speech | Ready with YOUR Elevator Speech? When we hear that request it’s usually YES! or YIKES! 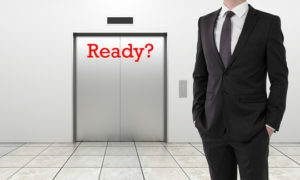 There are two distinct audiences for Elevator Speeches: Groups and One-on-One Situations. The Guidelines for both are the same, and explained below. Clarity is the first rule, and it is not optional. Everyone seeing and hearing you should know exactly what you do. If someone is scratching their head and thinking, “I have no idea what they are talking about,” you’ve lost them as a prospect and as someone who could possibly refer you. No Buzz Words, Acronyms, or Techno-Speak goes hand-in-glove with Clarity. You do not impress people with words and phrases they don’t know. You make them feel stupid and no one wants to feel that way. They will immediately tune you out. Ideally, they perceive you as an Expert. We like to work with Experts. We feel comfortable with them, and they can command more money for their products and services. People should also feel you’re Approachable and Easy to Work With. No one wants to deal with, or refer, individuals who are not nice. The Goals for both, with one major exception are the same, and explained below. I know what you do and I want to have a conversation now! I know what you do, but I don’t need your product or service. However, if I ever do have a need for what you offer, I’d be very comfortable having a conversation with you about how you work and charge. I know what you do, and definitely need (or don’t need ) your product or service. If I hear of someone I think would benefit by your offerings, I’d be very comfortable referring them to have a conversation with this you. A Template and Worksheet for developing your Elevator Speech is HERE. An Additional Goal of the One-on-One Elevator Speech is to DIS-qualify. Everyone’s not a prospect for what you offer. You’re not going to buy everything people are presenting to you. Don’t spend major time on minor possibilities. You want to, as quickly as possible, DIS-qualify people. It should clearly articulate, in a very concise manner, exactly what you do, with impact! And, because time is of the essence, give an EXPRESS Elevator Speech! You might have a tremendous Elevator Speech, but if it isn’t delivered in a manner that quickly educates, entertains, and explains it well, they will never GET IT! Now, Practice! – Practice! – Practice! Do that, and I guarantee your next Elevator Speech will be absolutely, positively – NO SWEAT!